A little know solution in our housewares department is the TrashRac trash storage bins. Maybe that is because they are by nature nondescript since they like to hide out inside cabinet doors? Maybe this is because they provide function without all the glamour of a tall stainless steel trash bin? Who am I kidding, the TrashRac doesn’t have the ability to campaign for itself! It is just as it’s name suggest, a rack to hold your trash. Out of Sight – Gone is the waste can that sits on the kitchen floor and is too often not close enough to the sink. With the TrashRac, our customers love how the trash can is right under the sink and is always on demand. Simply flip open the cabinet to clean off plates and to throw out kitchen waste. The TrashRac is designed to be small and convenient. 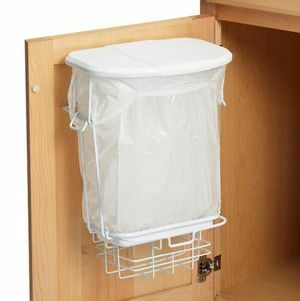 Traps Odors- The TrashRac includes a lid that helps to trap in odors from smelly kitchen waste. The bags are small too, so they encourage us to replace them often and the result is a better smelling, waste storage solution that will not encourage flies and other bugs to nest since it is being replaced frequently. Reduce, Reuse, Recycle – Many of us accumulate plastic grocery bags and we don’t know how to reuse them. Conveniently, both sizes of the TrashRac can hold your typical grocery bags! The handles help to hold the bags in place and the drip tray at the bottom will prevent small holes in the bags from making a mess inside the cabinet. Stop by our Housewares Department if you are interested in finding out more about this waste storage solution!